Clinton Ford will now be best remembered for his novelty song, "Fanlight Fanny"- a recording he made while he was with Oriole, a minor label which had association with the Woolworth's budget record brand, 'Embassy'. In fact Clinton Ford was one of Oriole's most successful artists for a while, and "Fanlight Fanny" looked like Clinton's break into the big time. Sadly, it never quite happened. Like many other artists of the time, Clinton had first excercised his entertainment ambitions by becoming a 'redcoat' at Butlins. Although his own leanings were towards country and western material, he began singing with traditional jazz bands and skiffle groups. This appears to have influenced his style somewhat and much of his best work was done in the company of trad groups like the Merseysippi Jazz Band and George Chisholm for example. Clinton's choice of recorded material was certainly diverse- with everything from the country flavoured sentimental 'Old Shep' and his confident interpretation of 'Run To The Door' through the most outrageous novelties like 'The Old Bazaar In Cairo' and even George Formby's 'Why Don't Women Like Me'. "The Melody Man" EP shown on the left (SEG8314) comes from his time at Columbia- the least successful part of his recording career. Here we find Clinton in the company of the Geoff Love orchestra rather than the Trad groups that he'd usually worked with in the past. He is apparently trying to emulate Frankie Vaughan, and sings the four romantic ballads on the disc well enough. Only the look in his eyes on the cover photo hints at the humour of the best of his work. Besides which, he could easily be mistaken for playing the part of 'Burlington Bertie', one of Clinton's favourite comic novelties. Clinton transferred from Oriole to the Piccadilly/ Pye stable via a short association with EMI's Columbia. This new label, appears to have taken him a lot more seriously than he'd ever been at Oriole. Although, he was rewarded with a minor hit for the splendid 'Run To The Door', it may have been a mistake. Although Clinton could really sing, he was probably still too firmly associated with novelties like 'Fanlight Fanny' to be able to get away with a romantic take of 'Try A Little Tenderness'. Sadly, Clinton Ford's presence and his comic songs slowly faded from our TV screens over the years and by the early 1970s the flow of singles had ceased. The singer continued into his sixth decade as a professional entertainer though his profile gradually diminished and, up until 2007 when he became ill, he could still be found occasionally singing about a lady called Fanny. 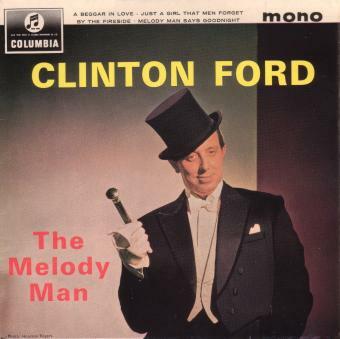 Sadly, Clinton Ford passed away in October 2009. Oriole EP-7027 1958 "Clinton Ford Goes Traditional"
Oriole EP-7068 1961 "Fanlight Fanny"
Fanlight Fanny/What More Can I Say/Ever Since The Day You Left Town/Who's Next In Line? Columbia ESG8314 1964 "The Melody Man"
Columbia ESG8366 1964 "The Wedding"